At 31 years old and with an 8-year old son, James Flores has been a nontraditional student. That’s a challenge, but he has faced down plenty of hurdles to getting his college degree: He grew up in innercity Milwaukee, a member of the Oneida Nation. And his father died young, which spurred him to pursue the possibilities life can offer. But in May, he became the first in his family to graduate from college. Flores graduates from UWM with pride and high expectations for himself. He plans to use the knowledge gained at UWM to help his community and to build a better life for his son. Why did you decide come to UW-Milwaukee? I originally transferred from the Milwaukee Area Technical College in 2013. UWM has an American Indian Student Services office, so I had advisers specific to my cultural background who helped me get tribal funding. I also liked that UWM has an American Indian studies program. When I started taking American Indian studies courses, I knew that it was my calling. It’s a cross-disciplinary program, so I learned about archaeology, anthropology, sociology, political science and ethnobotany. 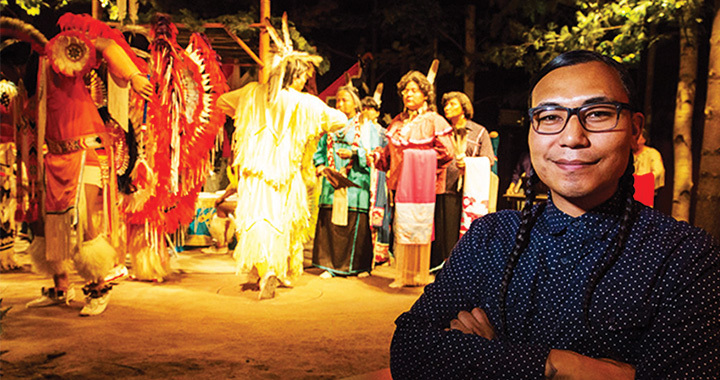 As a member of the Oneida Nation, the courses I’ve taken here have helped me with my identity and have helped me to share my culture with others. American Indian history isn’t just for American Indians, it’s for everyone. It’s part ofAmerica’s history. What opportunities have you had at UWM? My academic background helped me get an internship. I met the Milwaukee Public Museum’s curator of anthropology collections through a class, and she encouraged me to apply for an internship. When I got it, I worked on Native American programming, and I learned to contextualize and handle artifacts. A Support for Undergraduate Research Fellows grant also gave me the opportunity to study the cultural component of agriculture at the Tsyunhehkwa organic farm on the Oneida reservation. I researched the traditional method of growing beans, corn and squash together on an earthen mound. I also learned about traditional corn drying techniques, which the farm uses alongside modern dryers. My professors and I presented our research at the American Society for Ethnohistory’s 2016 conference in Nashville, Tennessee. I have moral obligation to spread what I’ve learned at UWM and positively affect my community. Education is the basis for any free society. People that don’t have higher education are restricted socially, politically, economically and geographically. I want Milwaukee to have an American Indian community center or a local Native American history museum. Other cities have these, so Milwaukee should, too. American Indians need to remember their history. We have gaming rights and tax exemptions because our ancestors signed treaties with the U.S. government. As their descendants, we have to keep retelling those stories. What’s it like being a first-generation college graduate? First-generation college students are examples for future generations. Escaping poverty takes generations. Some families have stories where college is the norm, where the parents have already been to college and where people have meaningful careers. It’s a phenomenal story, but it’s also a transgenerational process. It started with my mom encouraging me to focus on my schooling. Now that I have my degree, my son, William, will have more opportunities. He won’t have to worry about poverty while he works to get through school. I want higher education to be the norm for my grandchildren. I want them to believe that higher education is achievable, because their parents and grandparents went to college before them.